Invicorp (aviptadil/phentolamine) is a new combination intracavernosal injection for the treatment of erectile dysfunction. After suitable training, patients may self-inject Invicorp at home. Invicorp provides fixed doses of two agents with complementary mechanisms of action: aviptadil, a vasoactive intestinal polypeptide and phentolamine, a short-acting alpha-adrenoceptor antagonist. Aviptadil has a potent effect on the veno-occlusive mechanism, but little effect on arterial inflow, whereas phentolamine increases arterial blood flow with no effect on the veno-occlusive mechanism. Both drugs cause smooth muscle relaxation of the corpus cavernosa which increases cavernosal artery blood flow, producing an erection. Two studies of aviptadil/phentolamine intracavernosal injection were conducted in patients with predominantly non-psychogenic erectile dysfunction, using doses of 25 microgram/1mg or 25 microgram/2mg. In the first study, 304 men completed the dose assessment phase and 195 entered the placebo-controlled phase. Response rates were 75.1% with the 25 microgram/1mg dose versus 12% with placebo (p<0.001) and 66.5% with the 25 microgram/2mg dose versus 0.3% with placebo (p<0.001). The second study enrolled 236 men, of whom 171 were treated in the placebo-controlled phase. In total, 75% responded to the lower dose (vs 12% to placebo; p<0.001) and 66% responded to the higher dose (vs 18% to placebo; p<0.001). Erections lasted for a median of 54–56 minutes. More than 80% of patients were satisfied with the drug and more than 90% with the auto-injector. Improved quality of life was reported by more than 80% of patients and more than 75% of partners. The principal adverse event of aviptadil/phentolamine intracavernosal injection was transient facial flushing, which accompanied 34% and 40% of injections in the two studies, respectively. There were three episodes of priapism in total, and no reports of post-injection pain; 16 patients withdrew because of adverse events. 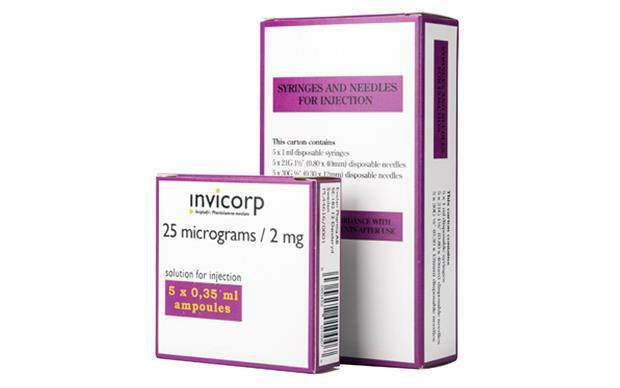 Initial injections of Invicorp must be administered by trained healthcare professionals, but after training patients may self-administer at home.